Within a year of becoming the Great Central Railway's (GCR) Locomotive Engineer, Robinson initiated an extensive programme of locomotive construction and modernisation. The programme started with his Class 9J 0-6-0 (LNER J11) and Class 11B 4-4-0 in 1901. Set against this programme of modernisation, the 11B locomotives turned out to be a throw-back to Parker's earlier Class 11 (LNER D5) design. The 11B had a similar cylinder layout to Pollitt's Class 11A (LNER D6), but replaced the piston valves with slide valves. Although the use of slide valves appears to have been a step backwards, it should be remembered that the D6s were still having a number of piston valve problems which were yet to be eradicated. As such, Robinson was clearly choosing a proven design over a promising but still problematic one. Although the cylinders remained 18.5in in diameter, the boiler was increased in size to 4ft 9in diameter. The firebox was also 8in longer, resulting in an extra 1.41 sq.ft. of grate area. Power was also boosted with an increase in boiler pressure from 170psi to 180psi. A total of forty 11Bs were built in four batches between 1901 and 1904. Sharp Stewart & Co. built the first three batches, and Vulcan Foundry built the last. In 1907, Robinson rebuilt two 11Bs (Nos. 104 & 110) with larger 5ft diameter boilers. The length of the firebox was greatly increased (from 7ft to 8ft 6in), but the slide valves were retained. These two locomotives were classified 11C by the GCR. This rebuild does not appear to have been a great success, and no further 11C rebuilds occurred. A number of Robinson's larger locomotive designs suffered from shallow ashpans. It is possible that although the firegrate area was greatly increasted with these rebuilds, the increase resulted in shallow ashpans. There is no direct evidence for this, but it would explain the lack of further 11C rebuilds. In 1909, a different rebuild was attempted. This used the same 5ft diameter boiler, but with the original length firebox. In 1911, this new boiler design was combined with a superheater and fitted to the A5 4-6-2Ts. Shortly afterwards, the new superheated boiler design was adopted for all 11B rebuilds. The D6 valve problems had been fixed by this stage, so the rebuilds also included a conversion from slide valves to piston valves. These rebuilds started in 1913, and were eventually completed in 1927. They were classified as 11D by the GCR, although the LNER classed all three variations as Class D9. The first few superheated boilers were built with 24 element superheaters. After 1914, the superheaters switched to a 22 element design. This was in line with a new Gorton policy for boilers of this size. Both superheater types required the fitting of a longer smokebox. 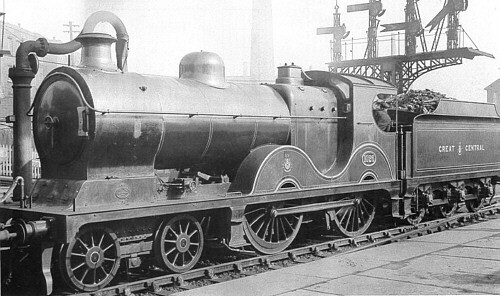 As already stated, the LNER classified all three variations (11B, 11C, and 11D) as Class D9. After 1928, the classification was divided into two sub-classifications, but this was according to the loading gauge. Class D9/1 was used to describe all of the locomotives which were still outside the LNER's Composite Loading Gauge. Class D9/2 was used for the locomotives which were now within the Composite Loading Gauge, due to the fitting of shorter chimneys, low dome covers, and repositioned whistles. The first conversions occurred in August 1928, but they were infrequent before 1933. The last conversion was in 1939, and the sub-classifications were dropped. When they entered service, the D9s replaced the D6s on the London Extension. The initial allocation was divided between the Gorton, Leicester, and Neasden sheds. Loads tended to light with 3-4 bogie coaches making a typical load, but the timings were very tight. For example, the Marylebone to Manchester Central service was scheduled to run in 2hrs 57mins non-stop. Increasing numbers of C4 4-4-2s and the introduction of the D10 'Directors' led to the displacement of the D9s from the best of the London Extension trains. By Grouping (1923), the D9s were concentrated at Sheffield (18) and Annesley (9), with smaller numbers at Immingham, Lincoln, Retford, Mexborough, and Liverpool. The D9s were the largest passenger locomotives allocated to Sheffield, and they hauled services in all directions. Soon, some of the Ivatt C1 large Atlantics would replace the D9s on their harder duties out of Sheffield. Duties at the other sheds were varied, but often included local and secondary passenger services. The Lincoln engines were noted for their workings of the Harwich-Liverpool boat train between Lincoln and Sheffield. The Annesley locomotives were mostly used for stopping trains between Sheffield, Nottingham, and Leicester. Annesley D9s were also noted operating many of the special services related to the British Empire Exhibition (1924-5), as well as various football specials. During the 1930s, the introduction of modern six-coupled locomotives on the main ex-GCR routes led to the displacement of the D9s towards the Cheshire Lines and East Anglia. The East Anglian allocations hauled a variety of services between places such Bury St. Edmunds, Cambridge, King's Lynn, and Peterborough. During this period, the most prestigious run was probably the mail train from Peterborough East to Liverpool Street via Ely and Ipswich. The East Anglian D9s also worked the Midland & Great Northern Joint Line (M&GN) after the LNER took it over in 1936. For this mainly single track line, four D9s were fitted with tablet catchers on their tenders in 1937. Although they moved away from this line in 1946, No. 6013 (BR No. 62300) was recorded in August 1948 with the tablet catcher still fitted. Withdrawals started in 1939, but were postponed by the outbreak of World War 2. By 1943, the D9s were allocated to Liverpool (9), Trafford Park (4), Stockport (2), Mexborough (3), Barnsley (1), Immingham (1), Staveley (1), March (6), New England (4), South Lynn (2), and Yarmouth Beach (2). Twenty six survived to March 1947, and all were concentrated in the Cheshire area. After Nationalisation (1948), the former LNER Cheshire Lines became a part of the London Midland Region (former LMS). This region started to use former LMS locomotives on the Cheshire Lines by late 1948, and the D9s quickly became redundant. The last D9 was withdrawn in 1950 from Trafford Park. The following details for the 11D's superheated boilers are for the standard 22 element variant. The earlier 18 element variant had 162 evaporative heating tubes and a total heating surface of 1524 sq.ft. Cylinders (x2): (inside) 18.5x26in. 19x26in. 19x26in. Heating Surface: Total: 1378 sq.ft. 1626 sq.ft. 1458 sq.ft. Firebox: 130 sq.ft. 148 sq.ft. 141 sq.ft. Grate Area: 21 sq.ft. 26 sq.ft. 21 sq.ft. The last D9 was withdrawn in 1950, and none survived into preservation. Bill Bedford produces a 4mm scale (OO gauge) kit of the D9. McGowan have produced a 4mm whitemetal kit, but this is no longer available. Gladiator sell a 7mm scale (O gauge) kit of the D9. Of the forty D9s, only four ever received names. No. 1014 Sir Alexander was named after the GCR's Chairman Alexander Henderson in 1902, after he received a baronetcy. The name was removed in 1913, when a D10 was named Sir Alexander Henderson. The remaining three named D9s were named after royalty, and kept their names until they were withdrawn from service. Thank you to the Mike Morant Collection for the photograph of D9/2 No. 6041. Thank you Malcolm Peirson for the photographs of GCR Nos. 104 and 1026.